Disc Gang Placement: The disc gang placement directs soil into the gang reels. The arrows show the initial direction of soil movement from the low angle (8 degree) gang angle. The gang reels located immediately behind the disc gangs, level the surface profile by preventing the lateral movement of soil that would create ridges and valleys. Adjustable Disc Gang Depth: The gangs are adjustable from 1" below to 5" above the cultivator sweeps and adjustment is accomplished with either the manual or hydraulically adjustable feature. Spring Cushioned Disc Gangs: The disc gangs are equipped with heavy-duty spring cushioned mounts for protection against obstructions such as rocks and stumps. This allows the gangs to penetrate more uniformly and prevent gouging when crossing ditches or terraces. Single Point Depth Control: The single point depth control is conveniently located at the front of the machine for easy access. Laser cut markings indicate the direction of movement for adjusting. Walking Tandems: Walking tandems are available on all sections, allowing the machine to follow the ground contour precisely, maintaining a more consistent shank depth. The tandem beam pivots on a set of greaseable tapered roller bearings for smooth, long lasting service. Zerk equipped six bolt hubs and heavy-duty 2" slip in spindles feature triple lip seals. Spring Cushion Shanks: With 26 inches of under frame clearance the 5/8 inch thick, 190 pound point load shanks on a 5 bar cultivator placement provide optimum trash flow. S-Tine Shanks: S-tine 160 pound point load shanks are also available if rocks and stones are not present and the heavier Spring Tension Shanks are not necessary. Maintenance-Free UHMW: Sunflower Land Finishers are equipped with maintenance-free lift and wing pivot systems. These systems pivot on UHMW polymer sleeves eliminating greasing. Screw Adjustment: Screw adjustment on the wheels provides precise wing frame leveling and is located above and to the front of the frame for optimum operator convenience. 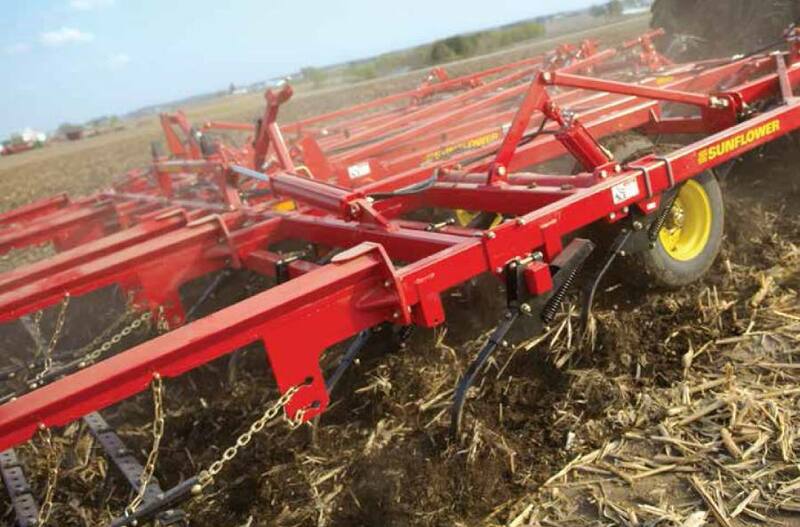 High Residue Six Row Spike Drag: The Six Row High Residue Spike Drag is designed for heavy residue conditions when using the 6000 Series Land Finisher. The Spike Drag consists of 3/4" x 16" round spikes. The longer spikes promote a smoother flow of residue, and the round design sheds heavy residue better than conventional square spikes. The combination of individual spike placement and the flexibility offered by individual bars make the 6-Row Spike Drag the #1 attachment in high residue conditions. Five Row Spike Drag: The Five Row Spike DRAG is regarded as our most maintenance free finishing attachment in low residue conditions. Equipped with 3/4" x 11" spikes, the flexible bars of the unit are designed to conform to very irregular terrain and the weight of the unit makes it aggressive enough to handle the toughest soil conditions. The 1 3/4" spike spacing provides additional incorporation and effectively completes the seed bed by breaking clods, leveling, smoothing and firming the soil. Three Row Spike Drag & Reel: The Three Row Spike and Reel combination features independence between spike and reel — in fact, each bar of the spike performs independently for maximum conformance to rough terrain. The heavy spike drag levels the soil in advance of the reel providing a smoother surface for the reel to run in. The 10 1/4” diameter reel features six high carbon spiraled blades, regreaseable bearings and no center shaft for better soil and residue handling capabilities. The aggressive action of this combination pulverizes the soil, provides superior leveling and enhances incorporation … leaving the seed bed in near perfect condition. Three Row Coil Tine and Reel: A Tine and Reel Finishing Attachment features a three row coil tine section that can be adjusted for the desired pitch. This attachment features height, tilt and spring loaded down pressure adjustments for various working conditions. A smaller diameter reel revolves at a higher speed which provides a more aggressive digging action for incorporating and preparing the seed bed. The reel features six high carbon blades which spiral across the 10 1/4” diameter section. The reel is independent from the coil tine when in the field and can even be folded up and over when not in use. Three Row Coil Tine: Three Row Coil Tine Harrow features 3/8” x 16” tines on 7 1/2” centers, 2 1/2” spacing overall. Tines are spaced 15” between rows. The unique tine angle adjustment features a direct stop mechanism that eliminates wear prone linkages and pins. Each tine is individually replaceable and the unit is designed to allow all tines to pivot forward for protection when backing up. Every section is equipped with fully adjustable tension springs that allow desired down pressure settings to be accomplished. Three Row Spike & Chopping Reel: The chopper reels are designed with offset blade sections to provide maximum residue management with a minimum of vibration. The 16 inch diameter chopper reel is used in combination with a three row spike drag with 3/4 x 11 inch square spikes on 1 3/4 inch centers for maximum residue management and leveling of the soil surface profile in preparation for planting.